Al-Amih. AD 808 to 813. Silver Dirhem. Date: AH 193 (AD 808). Reference: Album-221. MI 196 variety. Size: 23.1 x 24.5 mm. Weight: 3.98 grams. Grade: gVF for wear, but at some time there has been some cleaning, and there is some weak areas. Obverse and Reverse: Arabic inscriptions. Muhammad. AD 1198 to 1219. Qutb al-din Muhammad bin Zengi. 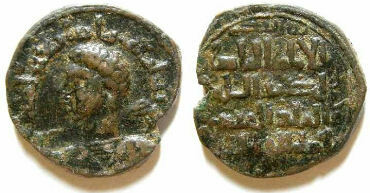 AH 594 to 616 (AD 1198 to 1219). Date & Mint: I have not attempted to read the date and mint on this coin, but these are normally Sinjar mint ca. AH 598. Reference: BMC 3, 622-628. Mitchiner Islamic - 1139 to 1140. S&S type 81. Size: 24.5 x 26.5 mm. Weight: 11.22 grams. Grade: good Fine. This coin is a mid to dark brown color, with some parts of the inscriptions off the flan. 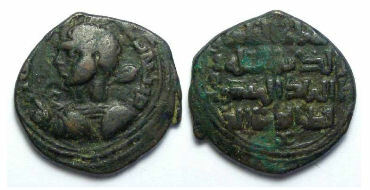 Obverse: Male head right, with a spear over his shoulder and a shield on his shoulder, with Arabic inscriptions around. The head is of a style that appears to have been copied from ancient some Roman coins. Abu Ishaq as independant ruler. AD 1337 to 1354. 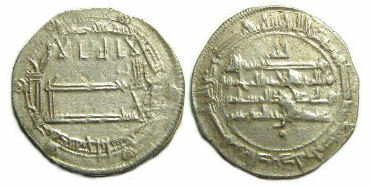 Silver Dirham. Ruler: Al Mutawakkil Abu Ishaq ibn Mahamud, ruled at first as a vassel of the Ilkhan king Abu Said, but on Abu Said's death in AH 736 (AD 1337) Abu Ishaq became an independent, but this only lasted 18 years when he was driven out by the Muzaffarids. Mint and Date: no mint or date is visible on this coin, which is normal for this very crudely struck type. Reference: Album-2275.2, Mitchiner Islamic #1734. Size: 19.0 x 19.1 mm. Weight: 3.57 grams. Grade: VF for wear, but with the typical incomplete strike. Qutb al-din Muhammad bin Zengi. AD 1198 to 1219. Mint & Date: I have not attempted to read the mint and date on this coin, but these are normally Sinjar mint ca. AH 598. Size: 24.1 x 26.1 mm Weight: 11.07 grams. Grade: VF. This coin is a mid to dark brown color, without the green tint the image suggests. It is also a little nicer in the hand than the image suggests. For those of you less familiar with medieval Islamic coins, it is important to note that most of these coins will have weak areas. We make note of these weak areas, but only for the sake of giving a complete description of the coins. In many cases it is impossible to find fully-struck specimens. We are not able to fluently read the inscriptions on these coins, and in many cases are not able to read the dates and mints. We will try to provide images that are good enough that people who are fluent in them can make them out. We would appreciate hearing about any of these items that we may have miss-identified. In AH 132 the Abbasid Caliphate was established when the Omayyads were overthrown by the descendants of Al Abbas (an uncle of the Prophet). Abbasid rule was quickly established over much of the Islamic world but after AH 172 their power began to decline as one province after another asserted it's independence until AH 334 when Abbasid rule finally came to an end. Under Harun-al-Rashid, Abbasid rule reach it highest point, extending from the Mediterranian Sea to parts of India. Harum-al-Rashid will be more familiar to many non-islamic people as one of the central figures in the tales of the Arabian Nights. In AH 907 Shah Isma'il Safavi ibn Haydar defeated Murad Ak Koyunlu of the Turkomans to establish the Safavid realm in Iran and part of Afghanistan. Copyright © 1997-2012 R & T Enterprises Ltd.